Enjoy a horseback riding holiday from a farmhouse, resort and spa in Tuscany, Italy with quality horses, facilities, riding and experienced, friendly staff. Riding vacations have been designed to include a variety of landscapes; shady Mediterranean forests, rolling golden grain fields, vineyards and olive groves. Stop for a gelato while you ride through a cobblestoned medieval village. Visit ancient castle ruins in the middle of a forest still inhabited by wolves and wild boar, and enjoy taking your horse for paddle in the water of the estates own private lake. This Italian Country Resort and Spa is located in the heart of Tuscany. The estate is located near Florence above the medieval village of Montaione. The owners of the estate Stefano and Alessandra are passionate about their horses and riding, and have invested extensively in the facilities of the stud farm and equestrian center. The Chianti hills offer varied and challenging trails for all levels of rider. The soft Tufo sand trails allow the opportunity to enjoy long canters even during the dry summer months when the ground elsewhere is hard. There are 52 different horses with some gentle enough for beginners and others more spirited horses suited to experienced riders. The speed is mixed, and experienced riders can be guaranteed some lovely canters on each ride, as well as interesting mixed terrain. Novice riders can enjoy a calmer pace with walk and trot – enjoying the wonderful landscape on sure-footed horses. Guides are locally qualified and know how to match horse and rider perfectly for an enjoyable Italy riding vacation. Although the term environmental sustainability has become a buzzword the last few years, it has always been a part of the daily life of this working farm in Tuscany. This Italian farm has a close relationship working with the land. The owners are dedicated to making sure families will be able to enjoy this Tuscan estate for many years to come, striving to be good environmental stewards while providing the modern amenities that many have come to expect. Children aged 12 years and over, who are competent riders, are welcome to join their family on the trail rides. Children aged 7 years and over can enjoy Western lessons in the arena. Kids under 7 can enjoy numerous age appropriate activities such as pony rides, pottery classes, arts and crafts and a trip to our lake in the tractor pulled carriage. On this Italy riding holiday, there is a team of multilingual babysitters that can care for children in a well equipped mini club. Spring and autumn are warm. Winters mild and summers hot. Rain is possible at any time of year but unlikely during the summer months. The riding here is Western style, which is unique in Europe and great for American riders used to riding Western. There is a herd of over fifty horses used for riding and breeding. The trail horses are a mix of Criollo’s imported from Argentina, Fjord horses and Quarter horses. For the breeding stud, the estate concentrates on Quarter horses and Paints, with some of the best international reining bloodlines. You can enjoy watching the foals frolicking with their mothers, stallions in training, and young horses starting their career with the trainers. The farm has one of the widest ranges of activities available in Tuscany. Rent a mountain bike, visit the onsite spa, play the largest golf course in Tuscany (neighboring the estate), enjoy marked walking trails throughout the estate, wine tasting (in the estate's own private cellar), and excellent sightseeing opportunities due to the enviable location of the estate (equal distance between Florence, Pisa and Siena and only 20 minutes from Volterra and San Gimignano). Specializing in Tuscany riding vacations, guests also enjoy Western horse riding, equestrian training, riding lessons, hiking, fishing, spa, wine tasting, olive oil tasting, the chance to see wild animals freely roaming (deer, boar, fox, badger, porcupine, wolf), cooking classes with Tuscan mama chefs, and truffle hunts (October/November). There is plenty to do for riders and their non-riding companions. Pisa (Leaning Tower, Duomo) Florence (Uffizi, Accademia etc) San Gimignano (Medieval festival in June) Volterra (Medieval festival in August) Siena (Palio during July and August should not be missed). Tuscan Style apartments and suites built into 12 original farmstead houses on the property. Each farmstead has its own swimming pool and Wi-Fi Internet, and the estate shares a central base with the spa, restaurant, cafe/bar and even a medieval church. Each suite/apartment has a private kitchen, sitting room, outside terrace/private area, bathroom and bedroom. Each farmhouse is distinctly different and there is a choice between premium and standard suites. The onsite restaurant features scrumptious Tuscan cuisine. Dining on the farm is a delightful experience. Italians are very proud of their regional cuisine, and here at Castellare di Tonda, this is no exception. Meals are prepared with the freshest of seasonal ingredients in the resort's own restaurant. You will enjoy eating Al fresco on the terracotta terrace during the summer months once a week a local musician plays Italian music while you dine. Anyone, whether beginning or advanced, looking to ride in Tuscany, Italy and especially USA riders that like the Western stye of riding. The Heart of Tuscany Relaxed Riding Vacation week includes 12 hours of riding, which can be a mixture of lessons and trail rides, or just 6 days of morning trail rides. You may also be able to join a full day ride, subject to ability and availability. If required, additional riding can be arranged locally. This is a great riding week for visitors hoping to also do some local sightseeing, wine tasting, or other activities such as the Spa while on their riding holiday. The perfect package to rejuvenate completely! * Prices are subject to changes in currency conversions. Sharing prices are based on two people in either a one bedroom superior apartment or a two bedroom classic apartment with a shared bathroom. The single person price is based on one person in a one bedroom classic apartment. INCLUDES Seven nights accommodation; half board; wine with dinner (half bottle per person); riding as per programme; tourist tax; twice weekly apartment cleaning. Medieval Tuscany also includes picnic lunch on three days. SINGLE SUPPLEMENT If you are willing to share a two bedroom apartment (one bathroom) and a sharer is available then the per person sharing price applies. If no sharer is available you will have a one bedroom classic apartment at the single person price and be refunded the difference if we find you a sharer. PAYABLE LOCALLY Lunches; drinks; optional tips; spa treatments; other activities; transfers. TRANSFERS We can arrange private transfers at a cost of €100, approx $116 USD*, (up to 3 people) / €145, approx $168 USD*, (up to 8 people) per vehicle each way from Pisa or Florence (payable locally). For the Heart of Tuscany we recommend a hire car. NOT INCLUDED Flights to Pisa or Florence. Arrive at Castellare di Tonda. Time to settle into your apartment and relax before dinner at 8pm in the on-site Castellare Cucina restaurant. Your first ride starts in the arena where our Trainers will help you with the western riding technique utilized with our horses. followed by a morning ride through the estate. This morning is a quiet ride giving you the opportunity to get to know your horse and to feel comfortable with the style of riding. A two hour ride through the estate over sandy paths, up to the Bosco Gucci and Bosco Armeno. Two beautiful wooded areas with narrow paths that zig zag through the trees. Return to base through Chianti vineyards. A two hour ride up past the village of Sughera, riding over the peaks of a range of Calanchi that overlook the Pisan countryside out towards San Miniato. We ride through an old farm with sheep, goats and cows, and home through cultivated fields of Olive trees and Lucerne. We may visit the artisan Riccardo on the this ride (depending on availability). Two hour ride to an ancient brick kiln used for hundreds of years and now a ruin overgrown with vines. The trail begins riding through the estate and then takes a turn into the neighbours vineyards before riding down into a shaded gulley through thick forest. The ride then utilizes a piece of roman road to return to base via an old game reserve full of deer and pheasants. Choice to take a full day ride to Castelfalfi village with picnic (leaving Friday as a free day to relax) or a half day ride through the hamlet of Casina down to the ANSA (a protected habitat for the rare spectacled Salamander). Final two hour ride to the Frantoio (olive oil mill) and protected forests of San Vivaldo. A mix of open fields with spectacular views and shaded forest with narrow trails. Possibility to stop for a coffee at a local bar. The Medieval Tuscany Riding Vacation takes place in a beautiful region of Italy that is world famous for its white truffles. Horseback ride between quaint medieval villages and ruined castles where the traditional rural lifestyle of cultivating and harvesting grapes, olives, truffle and mushrooms continues today. Travelling by horseback brings you in close interaction with your surroundings. Take your time, and inhale the wonderful culture that surrounds you as you ride the ancient trails that thread through wooded hills, valleys, rivers and vineyards in this unique historical and natural paradise. This Italy equestrian vacation includes around 20 hours of riding over the week. Your first ride starts in the arena followed by a short ride through the estate. This morning is a quiet ride giving you the opportunity to get to know your horse and to feel comfortable with the style of riding. In the afternoon ride through the estate, with more chances for challenging and slightly faster riding. Back at base untack and wash off your horse (your guide will be on hand should you require assistance with this). A full day ride to San Vivaldo Monastery, riding down through tufo sand trails bordered by Tuscan vineyards and open fields. Riding up over the Carfolo river you pass under Castelfalfi and into the Bosco Gucci, a protected forest rich with local fauna and some impressive three hundred year old trees. The trail leads down into the San Vivaldo reserve, passing through old logging trails cut into the middle of pristine forests. This ride has some spectacular panoramic views of the rolling hills, and passes the medieval ruins of Vignale borgo and Vignale castle. Stop for lunch at a shaded picnic spot above the Monastery. Later ride through a local Cinta Senese pig farm and twist and wind back through forest trails to Castellare di Tonda. A full day ride to the old Barbialla estate. The trail starts by passing under the stables and down to the Castellare di Tonda lake, before winding up through forest trails until you reach the village of Sughera. Ride through the outskirts of the village, and then over the confines between Pisa and Florence into the Barbialla game reserve. Here the terrain opens up, and the views reach out as far as Volterra and San Miniato, and there may be a chance for some lovely canters. Have lunch beside an old abandoned Tuscan farmhouse before riding back to Castellare di Tonda. Today the horses have a rest day and you can take the opportunity to visit Florence or Siena. Your guides will help you with transfers to the local train station where you can take a direct train to either Florence or Siena. Today's full day ride takes you through long stretches of Chianti vineyards and then down through the Castelfalfi estate to the Casa di Rogli for lunch. The farmhouse is located at the bottom of a well-stocked game reserve and it is possible that you will see wild boar, deer, and Mouflon. Pass underneath an ancient stone village with its own castle that dates back to the Longobard period, and then along narrow forested trails that lead down to the lake where the 2002 Pinocchio movie (Roberto Benigni) was filmed. The trail is rich in panoramic views, and again the terrain changes dramatically, opening up to wide fields full of flowers and sandy dirt roads lined with Cyprus trees, and hedgerows of sloe berries, rosehip and blackberries. This morning’s ride is a lovely mix of beautiful open vineyards and fields, and thick shaded forests that wind past pretty Tuscan stone farmhouses. In the afternoon a final sunset ride, enjoying some relaxing canters through the estate. American Quarter Horses have been bred on this Tuscan family estate for fifteen years. Home bred and trained horses have competed throughout Italy, and gone on to find success in many different disciplines, including reining, cow horse, trail and pony games. Franco’s training philosophy is to build a solid foundation with all their horses from the start, to create a safe, responsive and balanced horse. The principles of this training philosophy can be adopted for any discipline. Despite the seemingly relaxed attitude of both horse and rider and the loose reins typical of western riding, the advanced movements require concentration and high riding competence, therefore the Trail and Train program is suited for riders with a good intermediate or above riding ability. Our horses are trained for ‘reining’ a western sport designed to show the ability of a working horse in the confines of an arena. Riders are required to run one of ten approved patterns, divided into seven or eight maneuvers, including small slow circles, large fast circles, flying lead changes, 360 degree spins, Rollbacks and the exciting sliding stops that are the hall mark of the reining horse. The week long rider training vacation (five x one hour lessons) is combined with five, two hour trail rides in the afternoons, so you can relax as well. Franco will teach you techniques to assist in better communicate with your horse, at any level of riding, in almost any discipline. Lessons on our well trained Quarter and Paint horses can include the following topics: Mastering the four different reins, flexation, Lead changes and differentiating between the two kinds of change, body position, hip control, Teaching the lead, transitions, collection at the lope, speed control, lateral work, loose rein circles, backing, creating cadence with the horse, teaching the word ‘woah’, body position, keeping the forehand light, sliding stops (pre and post position), Spin work, Keeping the hindquarters planted, forehand footfall, following the nose (aids required for the spin), adding speed to the spin, sidepass, effective problem solving techniques. * Prices are subject to changes in currency conversions. Package based on twin share (one or two bedroom apartment, wine, half pension, tourist tax, riding). From Pisa or Florence airports, you are transferred to the villa in the afternoon. When you arrive you will have time relax and enjoy a glass of our white wine ‘Il Solario’. Dinner is at 8pm in the Castellare Cucina restaurant, also open to the public you can people watch and enjoy a full three course meal with wine and local liqueurs to finish. After breakfast at the restaurant walk down to the stables to meet at around 9.30 for a one hour lesson in the indoor arena with Franco and Marco. You can choose to eat a quick sandwich at the bar/café or take a full lunch in the restaurant. In the afternoon, around 4pm, enjoy a two hour trail ride through the estate. Dinner at around 8pm at the restaurant. In the afternoon, enjoy a two hour trail ride to Castelfalfi village, riding under the old medieval castle. After breakfast at the restaurant, walk down to the stables to meet at 9:30 for a one hour lesson in the indoor arena with Franco and Marco. Around 4pm in the afternoon, enjoy a two hour trail ride to the Bosco Gucci, a beautiful trail through rich forests full of wild game. Today the horses have a rest day and you will be driven to Castelfiorentino train station at 9am where you can catch the regional train to either Siena or Florence to spend a day sightseeing or shopping. There will be an organized pickup at 6:00 from the same train station back to the villa where you can have a shower and head down to the restaurant for dinner. After breakfast at the restaurant walk down to the stables to meet at around 9:30 for a one hour lesson in the indoor arena with Franco and Marco. At around 4pm, enjoy a two hour trail ride to Sughera and along an old shepherds trail overlooking San Minato. After breakfast at the restaurant, walk down to the stables to meet at around 9:30 for a one hour lesson in the indoor arena with Franco and Marco. In the afternoon, enjoy a final sunset ride with some relaxing canters through the estate and finish the week up with a Gin and Tonic overlooking the Tuscan hills. Dinner at around 8:00pm at the restaurant. After an early breakfast say your goodbyes and transfer back to the airport to catch your flight home. * This itinerary is flexible and subject to change based on the trip guide's discretion, the weather or other factors. I have just returned from a six night stay. I was travelling alone so she arranged a return trip to Pisa Airport; all my riding was organised and I had my spa treatments booked before I left the UK! I rode every day for 2 hours with Jessica, the countryside was incredible and the relaxed manner in which Jessica explored what I wanted to get out of my riding trip was a real bonus. She showed real commitment and interest in my achievements and her teaching style meant after so many years of NOT RIDING I was thoroughly enjoying myself and Cantering!!! I was offered options of tuition in an arena alongside riding out. It was great. Because of the Spa I was able to relax and be pampered in the afternoon prior to lying about the pool. Finally the food was as you would expect. Delicious. A really great place to visit! Jess and Ellie went out of their way to accommodate us. They changed my horse without a second thought. They were extremely professional and friendly, and each ride was different. Consideration was taken into account for all of the riders and their horses. In this memoir of her buying, renovating, and living in an abandoned villa in Tuscany, Frances Mayes reveals the sensual pleasure she found living in rural Italy, and the generous spirit she brought with her. She revels in the sunlight and the color, the long view of her valley, the warm homey architecture, the languor of the slow paced days, the vigor of working her garden, and the intimacy of her dealings with the locals. 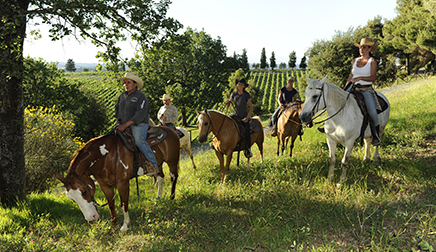 Horse riding holidays in the heart of Tuscany, Italy based on a historic wine and olive estate with a spa and Western style riding. Riding group max 10 people each week. The relaxed riding week is suitable for novice to experienced riders. The Medieval Tuscany week is suitable for intermediate and experienced riders. Western/ Endurance saddles for Trail riding. Expert Reining and Western Instruction is available on schoolmaster Quarter and Paint horses. Paint and Quarter Horses are bred at the estate. The trail horses are a mix of Criollo’s imported from Argentina, Fjord horses and Quarter horses. 12 for trail rides and 7 for arena riding. Relaxed Riding Week: 12 hours riding during a week. Medieval Tuscany week: approx. 24 hours of riding during a week.